Our Facilities will use state-of-the-art materials sorting technology and Advanced Thermal Treatments such as Gasification. Vehicles delivering waste to the Plants enter the Waste Reception building before unloading into a pit and hopper. During the unloading of waste, fast acting roller shutter doors will be closed when vehicles are inside the building to ensure that noise and odour emissions do not escape. Doors remain closed except during vehicle entry or exit. Waste is fed into the materials sorting technology which is used for the separation of recoverable materials from those which cannot be recovered in their material form – known as the residual stream. Various methods are used to sort and separate the materials, including screen, drums, air jets, optical devices and even by hand. The residual material, which otherwise would be sent to landfill, will be shredded to give material suitable for use as a feedstock, known as Refuse Derived Fuel (RDF) for the Advanced Thermal Treatment Plant. Recyclable materials sorted during the process are bulked up and transferred to dedicated recycling centres offsite. The syngas is then burnt and the hot gases used to create steam. The steam is used to turn the turbines to generate electricity. The flue gases then passed through a gas cleaning system to absorb and remove the small amounts of unwanted substances. It is then passed through a filter before being released into the atmosphere whilst continuously monitored and nationally regulated. The remaining by-product, known as ash, can be recycled for use in road foundations and other construction based materials. The facility will be operated under strict international environmental and regulatory guidelines. As part of the planning applications process, DRENL will undertake a series of environmental and technical studies and consult various organisations, including local authorities and the Environment Agency. Government supports energy-from-waste plants as they prevent waste from being put into landfill sites that then produce methane gas that is harmful to the atmosphere. 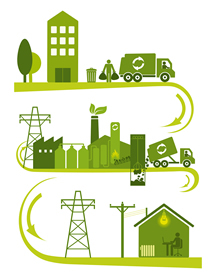 By using waste that would otherwise go to landfill we make sustainable energy for thousands of homes. This is a better use of UK resources and is better for the environment. We regard our relationship with the local communities close to our facilities as an important element of our work.. DRENL is determined to play our part in our host communities and not impose on them. During the planning process we hold exhibitions for local people and local community representatives. Throughout the planning process, as well as the construction and operational phases we are keen for members of the public to let us know their views and issues so we can resolve any concerns as quickly as possible. We are keen to invest in our local communities through local employment creation including apprenticeships, and support for environmental and education projects in the community. This is bespoke to each community where our plants are located and therefore driven by local community needs. Delivering affordable, low carbon renewable energy solutions for local communities across the globe using the best in class technologies – bringing power to the people. 2nd Floor, Berkeley House, Berkeley Square,W1J 6BD, England. Registered in England, company registration number: 08332548. © 2014 Drenl - All rights reserved.